Warner Bros. has released a new poster for the highly-anticipated Ready Player One, which is shaping up to be one of this spring's biggest box office hits. Like the previously-released footage before it, this poster offers a taste of 80s nostalgia, featuring the iconic DeLorean, best known for its use in the 1985 classic Back to the Future, along with a number of robots, creatures, out-of-this-world spaceships and several of the main characters that inhabit this futuristic world. With the countdown continuing towards the March 30 release date, it remains to be seen if any more footage will be released. From filmmaker Steven Spielberg comes the science fiction action adventure Ready Player One, based on Ernest Cline's bestseller of the same name. The film is set in 2045, with the world on the brink of chaos and collapse. But the people have found salvation in the OASIS, an expansive virtual reality universe created by the brilliant and eccentric James Halliday (Mark Rylance). When Halliday dies, he leaves his immense fortune to the first person to find a digital Easter egg he has hidden somewhere in the OASIS, sparking a contest that grips the entire world. When an unlikely young hero named Wade Watts (Tye Sheridan) decides to join the contest, he is hurled into a breakneck, reality-bending treasure hunt through a fantastical universe of mystery, discovery and danger. The first trailer was released at San Diego Comic-Con, and featured no shortage of Easter Eggs, including Iron Giant, Teenage Mutant Ninja Turtles, Freddy Krueger from the Nightmare on Elm Street franchise, the Statue of Liberty from Ghostbusters, the Akira motorcycle, a Tron lightcycle, the Scooby-Doo Mystery Machine and even Tom Cruise's stock car from Days of Thunder. When the entire movie unspools in theaters, it will likely be one massive Easter Egg hunt, which could lead to an increased number of repeat viewings which could certainly help its box office projections, although it doesn't have too much competition as of now. 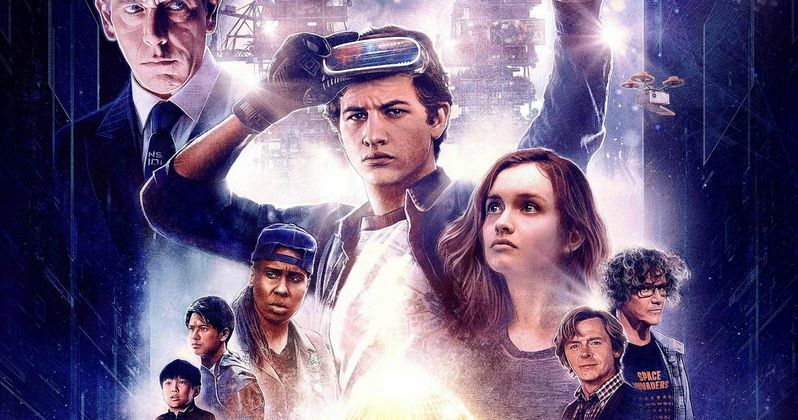 Ready Player One recently had its release date bumped up one day from Friday, March 30 to Thursday March 29, to get an early start on the Easter holiday weekend. While no other movies are slated to open on the 29th, Lionsgate's Acrimony and Electric Entertainment's Bad Samaritan are slated to arrive on March 30. There are also five movies opening in wide release on March 23, including Universal's Pacific Rim Uprising, Open Road Films' Midnight Sun, Paramount's Sherlock Gnomes, Bleecker Street's Unsane and Sony's Paul, Apostle of Christ. Despite all of this competition, Ready Player One should have little trouble at the box office next month. We also reported in December that a sequel novel is currently being written by Ready Player One author Ernest Cline. There have been no story details for this sequel revealed, including what year the story may be set. The 2011 novel was set in the year 2044, and it remains to be seen if there will be any sort of time jump, or if the sequel will directly follow the events of the original book. It's also possible that, if the Ready Player One movie does well in theaters, that this book could be optioned and used as the basis for a Ready Player One movie sequel. Take a look at the new Ready Player One poster, courtesy of Warner Bros. below.